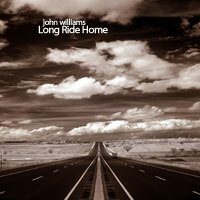 Not to be confused with the Aussie gitarist John Williams who I am also a fan of. I think it's something different when you're listening to Whole Wheat Radio or any other internet radio station and something comes on that you recognise. I've discovered so many artists listening to WWR (Kevin So, Guy Clark, Esther Golton (d'uh! ), Doofus, The Philadelphia Jug Band, Gypsy Jazz, Jim Brannigan, Caleb Coffee), but this is the first time I've come across someone I already knew. 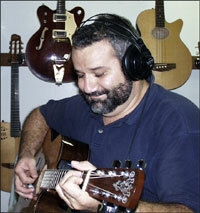 I’m a guitar player, mostly electric, steel string acoustic too. I do session work, songwriting, and production projects. I have a well-outfitted home studio for songwriting and some production, and I also work with a nationally acclaimed pro studio here in Seattle. I love his blues and jazz compositions and really appreciate the depth of his music. His Dusty Porch and Long Ride Home albums are on my (increasingly lengthly) Whole Wheat shopping list. My favourite song of his so far is Almond Joy which you can preview before you buy on Magnatune. Given Magnatunes' very liberal and friendly licencing policy for podcasters, I might play a sample on the next Rubenerd Show… hey I hadn't thought of that. I'm smarter than I look.